On November 13th, the Ministry of Health and Long-Term Care released the $500,000 Stage 1 Planning Grant funds to Stevenson Memorial Hospital (SMH). The money has been used to prepare the responses to questions remaining from the October 2015 Stage 1 submission and in the preparation of the Draft Stage 2 submission. This grant represents a significant step forward towards a redeveloped SMH. The original planning grant announcement was made on February 12, 2017 at Stevenson Memorial Hospital. Over the past year, SMH has worked in close collaboration with the Central Local Health Integration Network (CLHIN) in addressing the questions that arose from the Stage 1 submission. In addition, SMH continues to work collaboratively with the Minister's office, Capital Branch, and the CLHIN in ensuring the planned redevelopment meets the growth and medical needs of the surrounding community. The Draft Stage 2 has been developed and is expected to be submitted by December 2018. The redevelopment of SMH was the top political issue in the most recent provincial elections for this community. The plan includes increasing the size of SMH from 72,000-square-feet to over 161,000-square-feet, in addition to significant investment in essential equipment upgrades. The planned improvements and upgrades are necessary, as the communities that SMH serves are projected to grow from 73,000 to over 100,000 in the next 13 years. 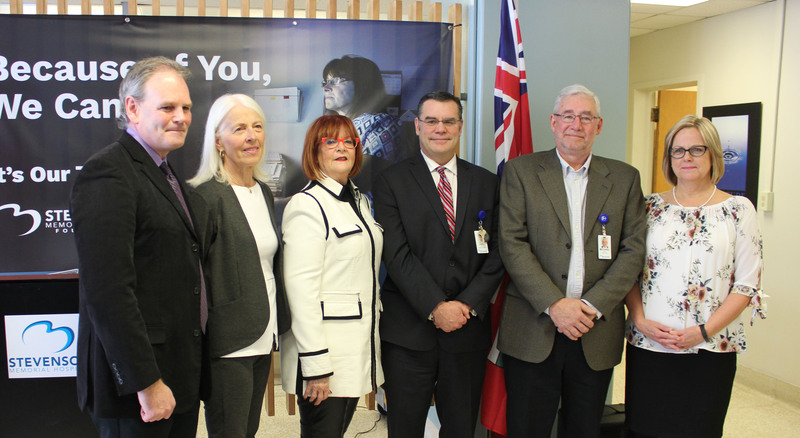 On Monday, February 12, Ann Hoggarth, MPP announced two planning grants of $500,000 each to help support the redevelopment of Stevenson Memorial Hospital and Collingwood General and Marine Hospital. The announcement was hosted by Stevenson Memorial Hospital, and representatives from Collingwood General and Marine Hospital, Central LHIN and North Simcoe Muskoka LHIN were in attendance. From L to R: Michael MacEachern, Board of Directors, Central LHIN, Kirsten Parker, Board Chair, NSM LHIN Board of Directors, Ann Hoggarth, MPP, Barrie, Jody Levac, President and CEO, Stevenson Memorial Hospital, Michael Martin, Board Chair, Stevenson Memorial Hospital Board of Directors, Norah Holder, President & CEO, Collingwood General & Marine Hospital. These planning resources in the early stages of the hospital’s redevelopment are crucial for ensuring our expansion meets the long-term needs of the community, and are indicative of the provinces recognition that the community is growing and needs a facility that can serve its long-term needs! "Today's announcement is a big step forward for our hospital and our community," said Jody Levac, President and CEO of Stevenson Memorial Hospital. "I want to thank the Ministry of Health and Long-Term Care for recognizing our hospital's need for redevelopment and providing essential funding to help us bring a renewed vision and revitalized hospital to our community." Stevenson Memorial is a vibrant, fully-accredited hospital located in the Town of New Tecumseth, serving the South Simcoe region. We endeavor to help ensure that the residents of our communities can access safe, quality care where and when they need it. We the thank the Ontario Ministry of Health and Long-term Care and the Central LHIN for this targeted investment that will allow us to fulfill our commitment to the communities we serve. Simcoe-Grey MPP, Jim Wilson has been supporting Stevenson Memorial Hospital’s redevelopment plan since its inception and is not stepping down from bringing the hospital and community’s needs to the forefront. This past week, Wilson spoke twice in legislature about the need for a redeveloped hospital in Alliston. Also standing up for the hospital’s redevelopment project are two volunteers and Grade 11 and 12 students Irby and Amze Syed, who have been connecting with the community to gather signatures for Wilson’s petition. Their mother, Dr. Shazia Ambreen, is an anesthesiologist and hospitalist at Stevenson. "They have been out knocking on doors getting signatures on the petition in support of the re-development of the hospital," said Wilson. "I want to salute them for their efforts and their amazing commitment to the local hospital and their community. Their passion and advocacy at such a young age will serve them well in future years," he said. Stevenson Memorial Hospital is a progressive rural-based facility that offers 38 inpatient beds and a variety of outpatient services. Built in 1964, the emergency department was originally built to support 7,000 patients a year and now services over 36,000 a year. To accommodate the growing communities’ health care needs, the hospital is in the process of preparing a Stage 2 submission to the Ministry of Health and Long Term Care (MOHLTC) for a redeveloped hospital. “We would not be where we are today without the support of our community,” says Jody Levac, President and CEO, Stevenson Memorial Hospital. “Jim Wilson, along with Dr. Ambreen, Irby and Amze have been working tirelessly to support our cause. They are wonderful ambassadors of the hospital and I can’t thank them enough for their commitment,” he adds. Stevenson Memorial Hospital has received recognition from the Ministry of Health and Long Term Care (MOHLTC) for the exemplary performance of its Emergency Department in 2015. In a letter from the Assistant Deputy Minister of the Health System Quality and Funding Division, Stevenson Memorial was commended for maintaining the lowest Emergency Department Length of Stay for all patients within the Medium-Volume Community Hospital Group. Stevenson Memorial’s average Emergency Department wait times were 4.7 hours, far less than the overall group’s performance of 6.6 hours. With the exception of a brief 3-month period, Stevenson Memorial has maintained this impressive ranking for three years. This ranking brings implicit recognition to the innovative systems that have been implemented hospital-wide through all departments which enhance patient flow. The Central LHIN is engaged in discussions with Stevenson Memorial to learn more about its best practices so as to assist other hospitals across the province in improving their Emergency Department performance. Stevenson Memorial: We champion your care… every step of the way. Stevenson Memorial Hospital continues to work with the Ministry of Health and Long-Term Care and the Central Local Health Integration Network (CLHIN) on its plans for construction of a new hospital facility. The ministry understands and appreciates the concerns that members of the local community have about SMH and its ability to provide services into the future. The ministry remains committed to making capital investments across the health care sector and will continue to work with the LHINs to assess needs based on sound fiscal planning; guided by its priorities for the health care system. “I was pleased to receive such a strong letter of support for our revitalization and redevelopment project,” says Jody Levac, President and CEO. The MoH recognizes that we are a growing community that needs a new revitalized facility in order to meet the needs of all those who live here. We’ve received additional questions from the Ministry and LHIN on the project that may be addressed at the next stage of planning if there is approval to proceed with the implementation of this important redevelopment project. We are in the process of preparing our responses to those requests for further information and data. We will continue to roll up our sleeves for SMH’s deserving communities, as we endeavour to deliver on our commitment to bring revitalized, state-of-the-art facilities to the South Simcoe region. We believe our redevelopment project is on track to be shovel-ready within the coming years, and Stevenson Memorial will continue to update the community on the progress of the project as it moves forward through the approval process. Stevenson Memorial Hospital, a progressive acute care community hospital serving South Simcoe, has received strong community support for its plans for construction of a new hospital facility to serve the community’s growing healthcare needs. Local town councils were briefed in December 2015 on the progress of the submission process and were very supportive of the project, which aims to build a new facility with modern infrastructure and services, including a new Emergency Department, OR facilities, Diagnostic Imaging and Lab, and refreshed outpatient clinics. The total gross square footage of the new facility will be 161,577sf (more than twice the current size of 71,925sf). Simcoe-Grey MPP Jim Wilson strongly supports the new hospital and revitalization of Stevenson Memorial Hospital, along with numerous community stakeholders, including Honda Canada, the Towns of New Tecumseth, Innisfil, Essa and Adjala-Tosorontio, Southlake Regional Health Centre, the County of Simcoe, and the Nottawasaga Foundation. In a letter dated December 24, 2015, Stevenson was asked by the Ministry of Health and Long Term Care (MOHLTC) further questions regarding data modeling, projections and Stage 2 (Functional Program) questions. The hospital anticipated this response and considers the Stage 2 questions as setting the stage for ultimate approval within the coming months. Stevenson Memorial is a fully-accredited hospital located in the Town of New Tecumseth, serving Simcoe County in central Ontario. Our mission is to help the residents of our communities access safe, quality care where and when they need it. Building a new hospital is aligned with that mission as we endeavour to provide accessible, first-rate quality care for future generations. Stevenson Memorial Hospital is dedicated to revitalizing and redeveloping our hospital to meet the needs of our community, a community that has outgrown a facility that was constructed in 1964. This is especially true when it comes to the Emergency Department. The 4,000 square-foot Emergency Department was made to accommodate 7,000 visits per year; yet, in 2012, Stevenson accommodated 29,888 emergency department visits. That number hit 33,424 visits for 2014-15. The facility is attempting to handle over four times the level of visits it was designed to handle! Thus, Stevenson is especially committed to upgrading its Emergency Department, as it is the “most relied upon and essential service” at Stevenson, accounting for over 50% of the total visits to the hospital. This is due to two factors: 1. All other hospital emergency facilities are more than 45 minutes away; 2. There is no public transit within or between those communities. On June 22nd, Stevenson Memorial Hospital submitted a 600-page Stage 1 Capital submission to the Ministry of Health and Long Term Care (MOHLTC). This weighty submission is actually the second step on a long journey of 5 years to this point towards revitalizing and redeveloping our hospital. The MOHLTC lays out a 6-stage submission process for redevelopment within the province of Ontario, beginning with a pre-capital application and going through 5 capital submission steps, ultimately ending when shovels hit the ground. We are optimistic that we can begin breaking ground in September of 2018. As we await the approval of our Stage 1 submission (expected in September 2015), we are reaching out to our community. We have two goals in mind. Our first goal is to make sure that we do our best to keep you informed. Our second goal is to get the community excited about the project through community engagement and, ultimately, community empowerment. Quality patient care is at the forefront of our minds at all times. It is with patient care in mind that we look at our current building and come to the conclusion that it isn’t enough given the realities of our community. This is confirmed by the Ministry of Finance through its population projections, as we need a facility that is more than two times Stevenson's current size of 71,925 gross square feet. As was mentioned above, our Emergency Department is outdated to meet the needs of our community, and without addressing this, our community could be put at risk, especially if a critical outbreak of an infectious disease hits our community in the future. The best answer to these eventualities is a new facility with modern infrastructure and services. These services would include a new Emergency Department, OR facilities, Diagnostic Imaging and Lab, and refreshed outpatient clinics. These upgraded facilities would help Stevenson serve our growing community well into the future. You, the community, play an integral part as we plan for the future. We need you behind us to show the province of Ontario how important a thriving community hospital is for our region. We will only be successful in implementing our vision through you – our community. Lifesaving change will only come about through a transparent open dialogue with our community. This is why we fully intend to engage with all stakeholder groups. We are not entitled to the respect of the community until we have earned it. Let us earn your respect for Stevenson Memorial Hospital by creating an experience you’ll be proud of. Total gross square footage of 161,577 (more than double our current 71,925, which would satisfy the size needed to meet the Ministry of Finance's community population projections). A wrap-around two-story design that extends the hospital to the north and west, while enabling clinical efficiencies between the Obstetrics and Medical-Surgical units. Preserving our helipad on the northeast, with an unimpeded flight path. Allowing for a dedicated internal road for ambulances on the west side of the property, away from traffic flows. Nearly tripling our parking spaces, ensuring accessibility for our patients. Total project cost estimate of $136,261,200, with a local share portion of $23,309,700 (the Ministry mandates that hospitals fund the local share portion through community fundraising efforts). The 5 capital project steps include our completed Stage 1 Proposal; once approved, we would then proceed to a Stage 2 Functional Program, move onto the Stage 3 Output Specifications, proceed to Stage 4 - Request for Proposal (RFP), and, lastly, Stage 5, Implementation and Construction. The Stevenson Memorial Hospital Foundation (SMHF) fully supports our efforts to redevelop the hospital, and the Foundation can meet the local share requirement of $23,309,700 mentioned above. In fact, the Foundation commissioned a feasibility study that shows the community has the capacity to raise up to $30 million if the project requires it. This study was conducted over a four-month period and involved 54 personal interviews and one focus group session in order to determine the best way to raise $30 million toward renovating and redeveloping the hospital. In addition, there is a letter of support signed by Hospital Foundation Chair Margaret Barber to raise the required local share for this project..
We want to make our intentions crystal-clear: We need a new facility, and as such, it needs to be centered on the needs of our growing community. We need a new Emergency Department that will be sufficient for the next 50 years. The hospital still ranks as the 2nd-fastest Emergency Department out of 74 medium and high-volume hospitals in the entire province of Ontario, but the only way this ranking will be maintained and potentially rise higher will be by upgrading the hospital and its facilities. Cancer Care Ontario recently named Stevenson as the most improved hospital over the past fiscal year. To maintain the high standard that Stevenson is exhibiting, we need to attract the best quality surgeons to our community. The only way this can be done is by having quality operating rooms that are sufficiently equipped. Our OR rooms need to be brought up to 21st-century standards. Improving the facilities and infrastructure for the diagnostic imaging labs will lead to the community experiencing lower wait times and a better level of care. By 2031, the population Stevenson will serve is expected to grow from its current 55,000 to over 90,000. Stevenson's services will be even more in-demand due to the fact that a large percentage of that 90,000+ will be of an older demographic, making it even more critical that we get underway with the renovations and upgrades Stevenson needs to provide the outstanding level of care to the members of this community when they need it most. Fortunately, SMH has a groundswell of support from the local community, including Honda Canada, the Town of New Tecumseth, Southlake Regional Health Centre, County of Simcoe and Nottawasaga Foundation, and the critical support of the Stevenson Memorial Hospital Foundation. We are truly grateful for the incredible support of this community and of the Foundation for its pledge to raise the local share. The redevelopment of SMH will be a community asset that we can all be proud of. For that to happen, we need your support and engagement. Participating in this crucial stage is critical to providing a better future for you and your families. How can you help? There are several things you can do. We need your feedback; we will listen and act upon your critical input. You can engage directly with your MPP Jim Wilson, and we’d ask that you sign your name to a petition of support for our redevelopment. An online petition of support for our redevelopment can be found at http://www.jimwilsonmpp.com/services/petitions . Political engagement is a necessary tool in ensuring this redevelopment process remains high on the government’s agenda. To ensure the success of our redevelopment project, we need to show the Ministry of Health that we have a truly engaged community that is committed to rebuilding this hospital. Successfully completing a project of this magnitude and scale will prove to be a monumental achievement. We expect it will be around September 2018 that we will be shovel-ready and well on our way to a new Stevenson Memorial Hospital. Our immediate aim is to get approval for our stage 1 submission from the Ministry. Our ultimate goal is to ensure that we are capable of positively impacting the health of the communities this hospital serves for several decades to come. We are enlarging our social presence by being more active on Facebook, Twitter, and Google+. Find us there and participate in the conversation. We need to hear from you. No contribution is too small. This is your community and your hospital. We need your involvement and engagement for building the best hospital possible to serve your needs and the needs of all surrounding communities for generations to come. We will be unable to do this without your involvement and support. A new billboard located outside Stevenson Memorial Hospital is creating excitement for staff and passersby as work continues on a redevelopment plan designed to expand the Emergency Department, Operating Rooms, Diagnostic Imaging and Laboratory areas. “Building the Best” is not only a pillar in the hospital’s strategic plan, it is also the goal of the Stevenson Redevelopment Committee (SRC) and the Board of Directors. Committee members were pleased to get a first look at the draft Master Program and an opportunity to provide feedback at the March meeting. Feedback from the SRC and user group meetings held with staff and physicians over the past few weeks will now be considered as consultants draft three Master Plan options for presentation to the committee on April 21, 2015. Chefurka International is leading a group of sub-consultants including HCM Group, Salter Pilon Architectural Group and Hanscomb Ltd. to develop three options for submission to the Ministry of Health and Long Term Care. Once endorsed by the committee, CEO Levac plans to present the draft Stage 1 submission, including three Master Plan options, to the Ministry of Health and the Central Local Health Integration Network (LHIN) at a joint meeting in May. Feedback will be incorporated into the plan prior to its submission to the hospital Board for approval in June. Redevelopment updates will shared with the community through local media as well as on the hospital website at smhosp.on.ca and through Twitter and Facebook. Use the feedback feature on our website to share your thoughts, or call the Redevelopment Hotline at 705-435-6281, ext. 1701 to share your thoughts and ask questions.Plans to redevelop the aging Emergency Department, Laboratories, Operating Rooms and Diagnostic Imaging departments are moving forward with support from the Central Local Health Integration Network (LHIN) Board. Senior managers, including President and CEO Jody Levac, held a planning session with Prism Partners Inc., a Project Management and Consulting firm with roots in the healthcare and research sectors. Chefurka International will lead the process of developing a Master Plan for the project, working with a group of sub-consultants including HCM Group, Salter Pilon Architectural Group and Hanscomb Ltd.
Project Manager Bob Savage will join the Stevenson team as well, bringing a long list of accomplishments on projects including Stevenson’s CT expansion in 2008. Groups of hospital staff and physicians will participate in meetings with the PRISM team this week, beginning a high level re-examination of master planning data compiled in 2008, current data to assess needs for all service areas. The input from these sessions will be co-ordinated by a Steering Committee to be chaired by CEO Jody Levac. Community input will also be invited as the planning process continues. “This is a very exciting time in Stevenson’s history as we continue to move forward with the critically important planning for our redevelopment. The community deserves a modern facility, and this is another key step in achieving our objective. Collectively, we want to design and build the very best,” Levac concluded. Stevenson submitted a pre-capital submission Part A in respect to the redevelopment project to the LHIN last year and the plan was endorsed by the Board of Directors. It now moves forward with a pre-capital submission Part B (physical and costs elements) completed and sent to the Ministry of Health and Long Term Care. The current facility, located on Fletcher Crescent, was built in 1964 with a 4,000 square-foot Emergency Department designed to accommodate 7,000 visits per year. In 2012, the number of emergency department visits reached 29,888. That number is expected to top 30,000 visits this year. “Our community has simply outgrown the facility, and it’s clear that we have broad public support for both this proposal and the fundraising effort that will be required to make it a reality,” says CEO Jody Levac. “A new Emergency Department continues to be this community’s number one priority,” he added, referring to an extensive period of community engagement conducted by the hospital prior to the pre-capital submission. The Emergency Department is the “most relied upon and essential service” at Stevenson, accounting for over 50 per cent of total visits to the hospital. Other hospital emergency facilities are more than 45 minutes away, and there is no public transit within or between communities. The current population of the catchment area is now greater than 55,000 and is projected to reach 90,000 by 2031. With planning well underway, an extensive community engagement strategy will be developed to ensure information is available and stakeholders are able to participate in the consultation process. As with all hospital redevelopment projects in Ontario, a portion of the total cost of the project must be raised by the community. The Stevenson Memorial Hospital Foundation is committed to raising the required funds.